Hello and happy Friday! 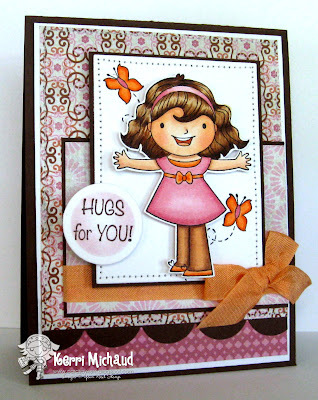 Every Friday is Fun Friday on the YNS Blog where you will find fab creations as well as helpful tips from the DT! For my card today, I used this cutie called Ellie Loves Butterflies. I just love that she's ready to give out a big hug and that sentiment is so sweet! The dp is My Mind's Eye Indie Chic Saffron, and the layout is this week's MFTWSC78. Make sure you stop by the YNS Blog to see the other amazing creations! I'm anxious to read Jenny P's tip on Glossy Accents:) Thank you so much for stopping by and have a wonderful day! This is so cute!! Wonderful card! She is the sweetest! Looks great popped up with the "released" butterflies all around her.